Even though this pizza is gluten- and dairy-free, I promise you’ll find it just as delicious (if not more)! See how fun and easy it can be to make your own pizza – and experiment with different combinations of toppings, to your personal taste. Preheat oven according to pizza crust instructions. Heat skillet, then add 2 T. olive oil, garlic, pepper and onion. Sautee until almost tender. Follow instructions per each pizza crust, though most will have you place the crust in the oven for 10 to 15 minutes before adding your toppings. Once the first step of the crust is finished, remove from oven , brush with remaining 1 T. olive oil, then your sauce and first layer of cheese. Sprinkle the nutritional yeast on top of the cheese. Top with sauteed veggie mixture and sun-dried tomatoes. I like to add another layer of cheese on top of this. Return pizza to the oven and bake until the cheese melts and the crust is crisp, following pizza crust instructions. There's so much you can do to create your own delicious pizza. Use whatever veggies you like. I also often use pestos instead of marinara sauce - when using a pesto, you don't even need cheese! Grilled chicken, sausage, salami, pepperoni, prosciutto (though of course these options aren't vegan), the list of possible toppings goes on, depending on your creativity and your individual food issues and taste. Remember that pizza's much more than just cheese and tomato. 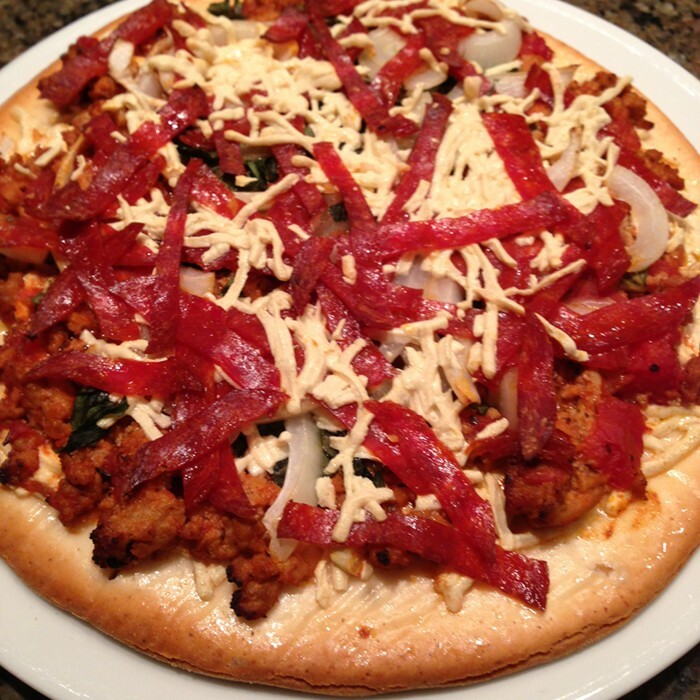 Let everyone in your family choose a favorite topping on pizza night - serve with a salad, and you have a great meal! From my table to yours - enjoy!